Dr. Jennifer Garza started working at Edinburg Medical Center at the age of 10 as the “head plant cleaner,” a position created by her father, who was a physician there and wanted to give her the chance to realize what she was capable of. She spent the following summers working in the hospital, moving up to filing in her teens and answering phone calls in college. Though she joked about her mundane tasks, she was gradually trusted with more responsibility. What Garza did not know was that decades later, she would dedicate her life to giving children the opportunity to realize their potential. Just like Garza’s dad did for her. 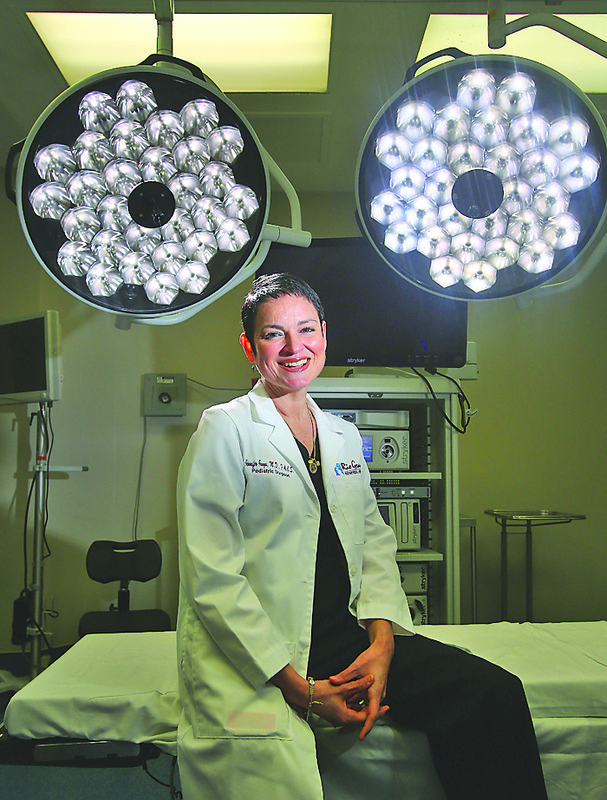 An Edinburg native, Garza, 47, is going on her second year as the chief of surgery at Rio Grande Regional Hospital in McAllen. Granddaughter to Garza Pharmacy founder Leonicio Garza, she is the only female pediatric surgeon in the Valley, according to the hospital, and has been there since 2007. She has since kept those words close to heart. After graduating from the University of Texas-Pan American (now UTRGV) with a bachelor’s in biology, Garza attended the University of Texas Medical Branch in Galveston. As part of her program, her last couple years there were spent in rotations between medical subspecialties. In rotations, students spend a few months in each medical field to learn about the distinctive demands of each before picking a specialty. Surgery was Garza’s last rotation, and she remembers taking it as a sign to be patient about her future career. As part of her surgical rotation, Garza assisted in a Whipple procedure — an eight-hour long open abdominal surgery on the pancreas. Her role was to retract, which is to hold the patient’s muscle, skin and spleen with a surgical tool during an operation. That was the moment, in that crowded operating room, she decided to become a surgeon. After graduating from UTMB, she began her five-year general surgery residency at St. Mary’s Hospital in Waterbury, Connecticut, a Yale University program. As a surgical intern there, Garza spent time in rotations that exposed her to the subspecialties in surgery. For her plastics rotation, she was placed in a craniofacial pediatric clinic, a surgical specialty that reconstructs facial deformities. The clinic was located in New Haven, Connecticut, and Garza called it serendipity that she was placed there. At the clinic, she learned that surgeons began their days by reviewing patients’ charts and photos to determine where to operate first. In the hours spent constructing their approaches, doctors considered children’s school schedules. After the meeting, she remembers walking to the pediatric surgery office to ask what her next steps were toward becoming a pediatric surgeon. Garza paused two years into her residency at St. Mary’s Hospital to do research at Boston Children’s Hospital with Harvard University. But before leaving, her mentors from Galveston, Dr. Stanley Dudrick and Dr. Jonathan Rhodes asked her for a favor. Dudrick and Rhodes invented total parenteral nutrition, TPN, a method of feeding when a person cannot eat or drink normally. Through a tube that connects to one of the larger veins in the chest area, patients receive a nutrient fluid that supplies all the body’s needs. Short bowel syndrome, SBS, is the most common reason for a child or baby to be TPN-dependent. Also known as short-gut, the condition leaves a child unable to absorb nutrients normally due to lacking a part of their functional small intestine. However, TPN is just a temporary solution. Dependence on the fluid for an extended time damages the liver, and though it bought patients more time, children with dire bowel cases such as short-gut later died of liver failure. Knowing that she was going to conduct research at Boston, Garza’s mentors asked her to find out why TPN was causing the fatal liver condition. Before leaving to Boston, Garza said she understood the vastity of the problem ahead. At Boston Children’s Hospital, Garza worked with many children with bowel problems, but there was one case she said she would never forget — that of a 7-year-old girl diagnosed with short-gut syndrome who was surviving on TPN. Garza was assigned the girl’s case during her first year of research. She recalled that while doing rounds one morning, the girl told her that she was not like the other children. Garza recalled the girl saying that she did not feel well because of her lines (her scars) and that “the angels” told her that it was her time to go. The girl said she told “the angels” she was ready, but asked to live to her eighth birthday, which landed on the next Saturday, Garza recalled. She died of liver failure the following Wednesday. Dr. Puder is the pediatric surgeon at Boston Children’s Hospital, and with nutrition pharmacist, Dr. Kathleen Gura, they agreed to partner with Garza in efforts to prevent TPN treatment from causing liver failure. Before research began, Garza learned that physicians of Boston Children’s Hospital tried achieving the same feat 20 years earlier. Though many theories only lead to dead-ends, their research heavily investigated the fat contents of TPN fluid and its possible correlation to liver damage. TPN solution is composed of three main elements: sugar, protein and fat. Since past physicians of their hospital had already started studies on the fat component, the research group of three decided to start there — another fateful moment for Garza. They soon discovered that a majority of the fat administered in the fluid was comprised of Omega-6, a compound they learned to be pro-inflammatory and responsible for agitating the liver. In search of a replacement for Omega-6, they discovered that Fresenius Medical Care, a German medicine supply company just created Omega-3, also called Omegaven, an anti-inflammatory fatty compound they did not have any purpose for, yet. Garza, Puder and Gura had the new fluid shipped to them and with a group of mice, tested the effects of the compound. In their trial, half of the mice were administered Omega-6, the original TPN fluid. As expected, all of them soon experienced liver failure. The rest of the mice were treated with Omegaven, and Garza said that they were astounded by what they witnessed: not only did the Omegaven group stay healthy, but the solution healed the damaged livers of the mice who were previously issued Omega-6. The group later performed many more trials, all of which proved that Omegaven reversed liver failure, but the compound was new and not FDA-approved. Therefore, it could not be administered. Garza was asked to stay a third year in research in Boston, and though she said it was difficult to decline, she wanted to prioritize her endeavor to become a pediatric surgeon. She moved to Oklahoma City, where she completed her pediatric surgery fellowship at the Children’s Hospital of Oklahoma. Now with her 5-year-old son Henry, and husband Brandon Hausenfluck, Garza has dedicated her life to children’s medicine. She said that though she was glad to have the opportunity to work at hospitals around the nation, her intentions were always to come back home. Though Garza sacrificed a third year of research at Boston to become a pediatric surgeon, she was met again with the work she did there 18 years after leaving. Garza learned last year that Omegaven was FDA-approved. Last July, the solution was approved for use in the U.S and has been available to patients by prescription since November. And last month, Omegaven was used for the first time in Rio Grande Regional Hospital. A premature baby boy who was born almost 15 weeks before his due date had multiple infections that were impeding his bowel movements, and they could not find out why. McAllen physicians agreed to allowing him to grow a bit more to make it easier to identify the issue. The boy was put on TPN for that time — the new version of the fluid that contained Omegaven — and a few months later found the problem and fixed his bowel. At 3 months old, the boy was discharged and allowed to go home for the first time on March 18. Garza said her drive stems from her passion for children. “They give me more joy than I could ever give them. Most of them will never know my name. They will never know what I have done or not done, they will just know that they have this little incision,” she said, drawing a line with her finger across her stomach. Editor’s Note: In observance of Women’s History Month, The Monitor recognized local women who inspire us. This is the eighth and final profile on those who made our 2019 list of “Women We Love,” a series we published every Monday and Thursday in March. Correction: This story was updated to reflect the correct name of a doctor.